(AP) DALLAS - It's the worst year ever for West Nile virus in Texas, which has seen about half of the country's deaths from the illness this year, health officials said Wednesday. At least 43 people have died from the virus in Texas, and the state has recorded at least 510 cases of neuroinvasive West Nile, considered the most serious form of the illness because it affects the nervous system, according to the Texas Department of State Health Services. That's already worse than in all of 2003, when Texas had 439 neuroinvasive cases and 40 deaths. What's making the 2012 West Nile virus outbreak the worst ever? 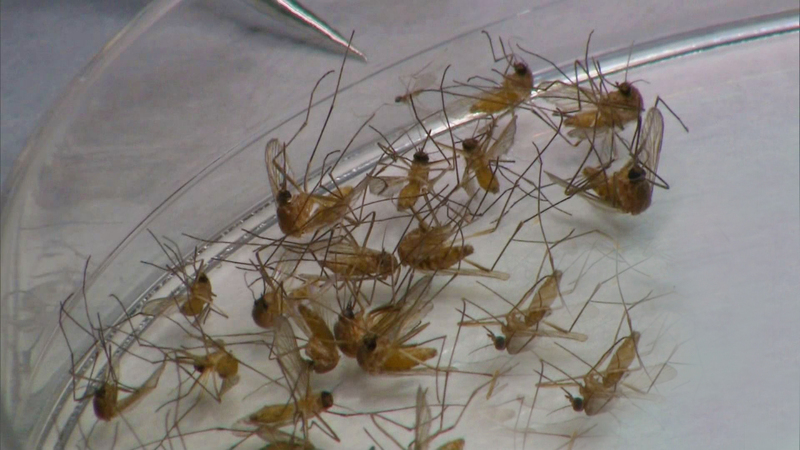 "Even if West Nile virus transmission were to stop today, we would continue to see reports of cases for several weeks," said Dr. Lyle Petersen of the Centers for Disease Control and Prevention. Federal officials say there have been at least 87 deaths nationwide reported to the Centers for Disease Control and Prevention this year. There are reporting delays as numbers from individual states are compiled, so that number only includes 35 deaths in Texas. Nationwide there have been at least 1,069 neuroinvasive cases and 924 non-neuroinvasive West Nile cases. Combined, the total is the largest number reported to CDC through the first week in September since West Nile was first detected in the U.S. in 1999, Petersen said. Texas has recorded 530 non-neuroinvasive cases this year for a total of 1,040 cases. Texas has been working with the CDC this summer to help eliminate mosquitos that carry the disease, including aerial spraying of insecticide in parts of North Texas. Texas Department of State Health Services Commissioner Dr. David Lakey said noted that in areas that received two consecutive aerial sprays, the number of mosquitoes decreased by 93 percent. "Transmission is contingent on mosquitoes," Lakey said. "The more you have, the greater likelihood of an outbreak." Mosquitoes get the virus from feeding on infected birds and then spread the virus to people they bite. While experts say high temperatures may have contributed to the boom in cases, Lyle said officials are still studying what exactly has made it such a deadly year for West Nile, especially in the Dallas area. Dallas County has seen the most deaths statewide with 13. Petersen said more than 70 percent of the cases this year come from Texas, South Dakota, Mississippi, Oklahoma, Michigan and Louisiana. All states except Alaska and Hawaii have found West Nile virus in people, birds or mosquitoes this year. Symptoms for both forms of West Nile can include headaches and fever, but those with the neuroinvasive form can also suffer from symptoms including coma, convulsions and paralysis.